rubberbanding since days, everyday same story. Rome, Telecom, 100\20Mb. Fix it. I've been having some pretty bad ping problems lately, a couple months ago i was getting 60-80 with no problems, now when i join a game it starts at 80 then goes all the way up to 160-190, every game, constantly, there are no programs running in the background, other games run fine, i get 30 ping tops on CS:GO, so its not my internet provider (Movistar, South America). Now every shot, the ball basically just ignores me and goes through the car. I've tried a lot of solutions i found around but nothing has any effect. im on xbox one and for about a week now I keep getting "connection to game timed out" message. I get it after 3 to 4 matches. once the match ends and I ready up in the post game lobby, I will get booted back to main menu with the connection to game timed out error message. can anyone help? its getting very annoying and has even happen a couple times mid-match. I have windows 7, I play the game on Steam. I don't understand why iranian guys can't play this game! DEAD_END wrote: I don't understand why iranian guys can't play this game! Hey. Last night, problems with connecting to servers in the RU segment began. When trying to find a match, playlists were not displayed, there was a message "it's loading". If I was taken to a party, then in the rating match I did not have a rating. The problem was solved after changing the language in the game into English, but does not work in Russian. And I'm not the only one with this problem. What is the reason for this problem? trumpee_vampee wrote: Hey. Last night, problems with connecting to servers in the RU segment began. 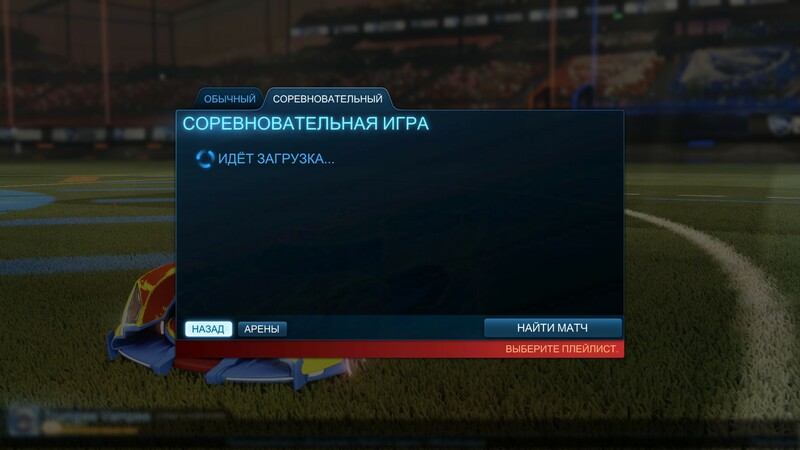 When trying to find a match, playlists were not displayed, there was a message "it's loading". If I was taken to a party, then in the rating match I did not have a rating. The problem was solved after changing the language in the game into English, but does not work in Russian. And I'm not the only one with this problem. What is the reason for this problem? There was an issue with the Russian version that should be resolved now. Hello, 5 days ago my Windows 10 had a mandatory update. I had been playing Rocket League for almost a year without any problems. After this update I haven't been able to join an online match. I can hit play online and begin to search for a game but as soon as it finds one I get an "Error 67" and cannot fully join the server. I've done everything with port forwarding, firewall, and all the other connection check boxes given to me and have yet to find a solution. I cannot undo the update unless I want to fully reinstall Windows 10 Any help would be appreciated. Hi, I have recently have had an issue with the Rocket League servers. It says I don't have a connection to the Rocket League servers and I did play this game perfectly yesterday. I think it may be the recent Autumn update. help is needed. Not logged into Rocket League servers - out of nowhere. The solutions posted in this thread seem to not work for me. Anything else I can do? This is a great topic and I’m sure it helped a lot of people on pc but could you send me the instructions for Xbox? I have been in conversation with your support team for the last month with these same connection issues but they have not been able to help me at all. The issue continues to happen daily. Thank you! i have windows 10 and i have a problem with rl. Unable to contact rocket league servers from ur latest update.. Can u have a fix for it ? Re: Error 42 y 58. Cuando busco partida va todo bien me uno y justo cuando esntro me saca de la partida y me sale uno de estos dos errores. Si pudieran ayudarme lo agradeceria.